In my area of southwestern Pennsylvania morels are not as plentiful as I would like them to be - like they are in northern Michigan. Because of that I spend a lot more time in the woods on a daily basis searching for them AND I am always looking in new areas for them as well. Because I spend a lot of time searching and because I know what I'm doing to find them I am often rewarded. Some people say I am lucky. Luck is only part of it though. "Good luck comes to those that know how to search". One of those good luck things that I find sometimes, either by itself or with morels, is Dryad's Saddle - Polyporus squamosus. It does not get a lot of respect as a good edible in most books and write-ups but take my word for it - if you pick it at the right stage of it's growth, process it correctly for cooking and cook it in the right way you too will consider it a lucky find. 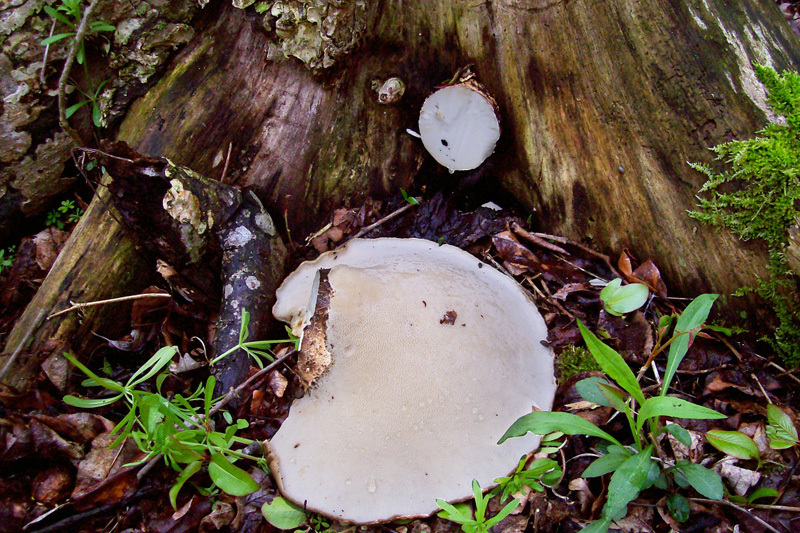 You will find it growing on dying or dead hardwood trees. I find it quite often on elm trees that look like they are dead. That's probably because I spend a lot of time searching for morels where there are lots of elm and old apple trees. These mushrooms are sometimes called Pheasant back mushrooms because of the feathery looking surface. The light brown color with darker scales arranged in a pattern of overlapping feathers gives them that look. Here's a closer view of the same mushroom. Mostly these mushrooms have a lateral stalk attachment to the trees they grow on. Here you can see the white circluar area on the tree trunk where I cut off the fan shaped cap. 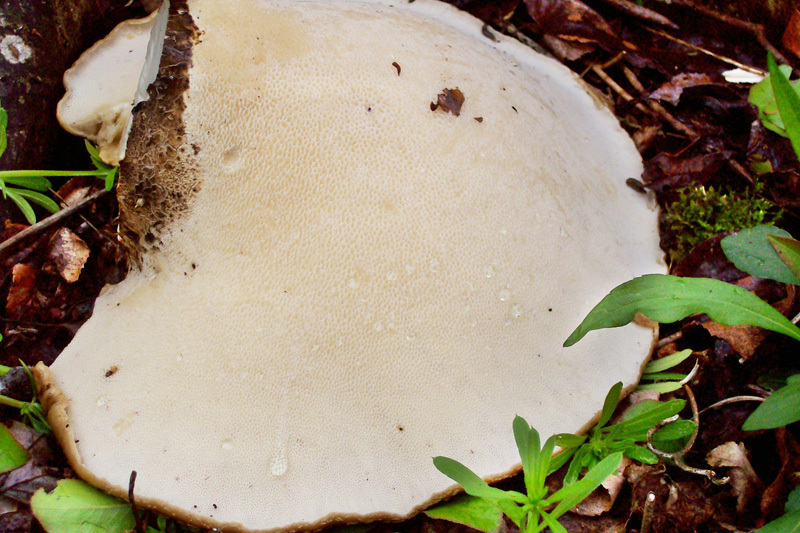 If you cut this mushroom off early in the season you can sometimes be rewarded with a second harvest later in the same year where the cutoff was made. 'a surface with scales ( squamae ). Scaly appearing'. Aptly named. If you flip it over you will see the pores without much trouble. 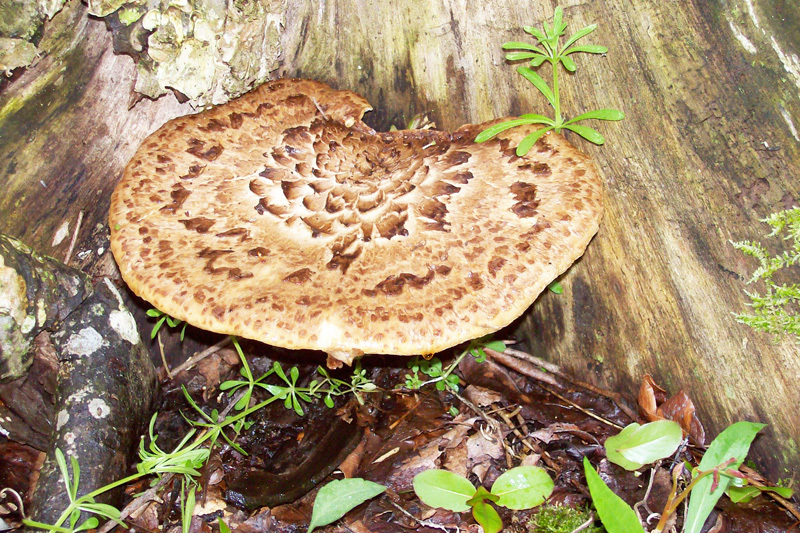 They are large, angular pores, whitish to cream colored and very obvious to the naked eye. Spore print is white. Also very obvious is the non-mushroomy aroma. Some people describe the aroma as similar to watermelon rind. Pinch off a piece of mushroom and check it out. It is very distinctive. I agree with the watermelon rind smell. In the spring the underside will oftentimes be very watery indicating a high degree of freshness to the mushroom. Flesh is whitish. If very fresh it could be a little marbled. When fresh, the mushroom is a very good find. When not fresh don't bother with it. Size is not necessarily an indicator of freshness. I've found some large ones, growing under perfect conditions, that were as fresh as can be imagined. So don't ignore the big ones out of hand. Check them out by making a knife cut along the perimeter. If it cuts really easy it is probably a good one. It's tasty enough to satisfy my discerning taste buds. And, it's a lot easier to clean and get ready for cooking than morels are. Don't get me wrong. 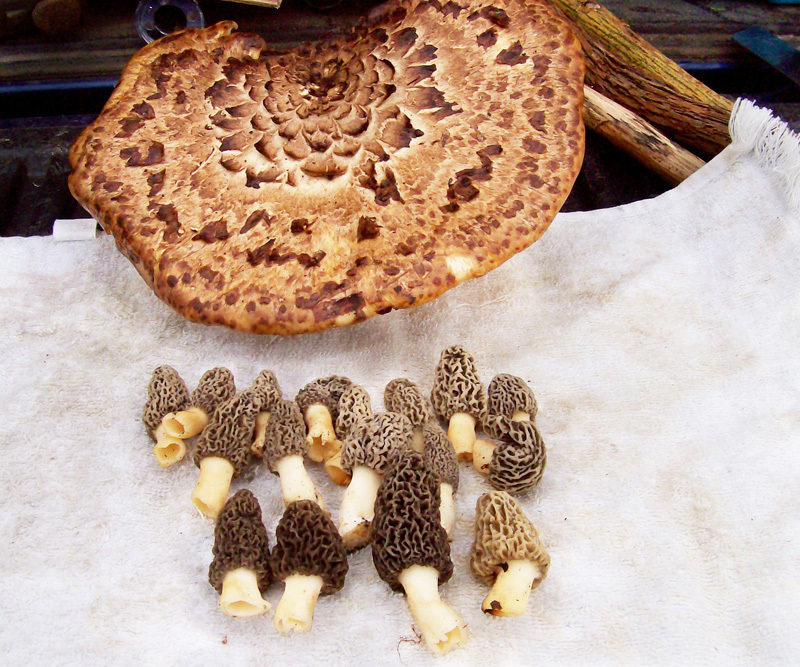 I like morels but I have several mushroom varieties that I pick that I like more. When you know many wild mushrooms to choose from you too would agree that there are several that are better. I am a stickler for clean, fresh food and especially so with wild mushrooms so "easy clean and prep" is a great benefit about fresh Dryad's Saddle. The pores will eventually turn brownish where bruised. Take your slices in stages working from the edge toward the area where the stalk was attached. Working the slice parallel to the edge, about one inch thick works fine. As your cutting gets closer and closer to the stalk area ( on the left side of photo below ) you will notice that the cutting gets progressively harder. What we want is mushroom flesh that cuts very, very easy. Another thing that we want on the Dryad's Saddle we plan on eating is a very thin pore layer. Around 1/16 of an inch or a wee bit thicker is perfect. 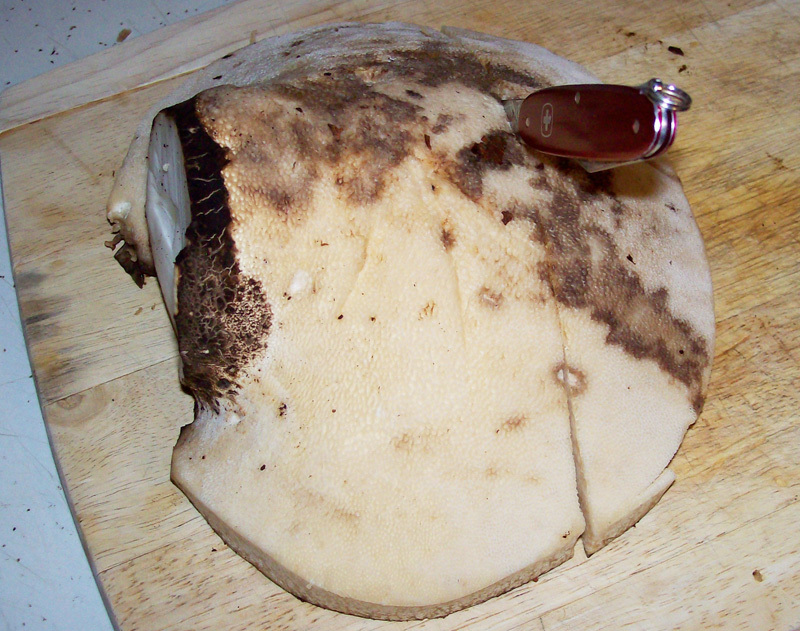 Once the pore layer gets a bit too thick the mushroom has gotten past it's prime and will not cook up nicely. I'm sure that the negative assessments about it's culinary uses is due to someone cooking up specimens that have passed their prime. I've experimented with cooking older specimens myself. You can't do much with it. It gets chewy. It will do for making soup stock but that's about all. 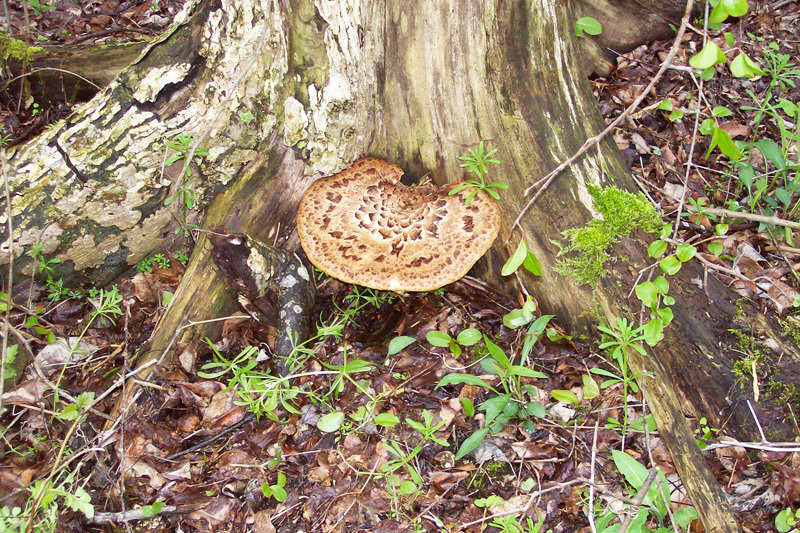 Best practice is to gather Dryad's Saddle when their condition is very easy to cut. Also, another good practice is to slice off the tube layer and the cuticle ( the outer skin ) prior to cooking. Cut into small pieces or thin slices and saute small batches reasonably quickly. A little olive oil and butter will do nicely. DATE - April and May 2014. FOUND - Most anywhere that has a lot of downed hardwood. Especially good are places with many dead and dying elm trees. Weather conditions: Wet. On and off drizzles on the day found. Mostly the weather this spring has been colder than usual.